Hi guys! So, I've been recovering from spinal surgery for awhile and I feel like it's been forever since I've posted. I'm still having good and bad days so it slow going! However, I think I could be dying and still be decorating. At least in my mind I would still be decorating:-) So with lots of help, I've finally got my next tablescape together! We don't have little kiddos running around so I decided to post a grown-up table for this Easter. No pinks here. 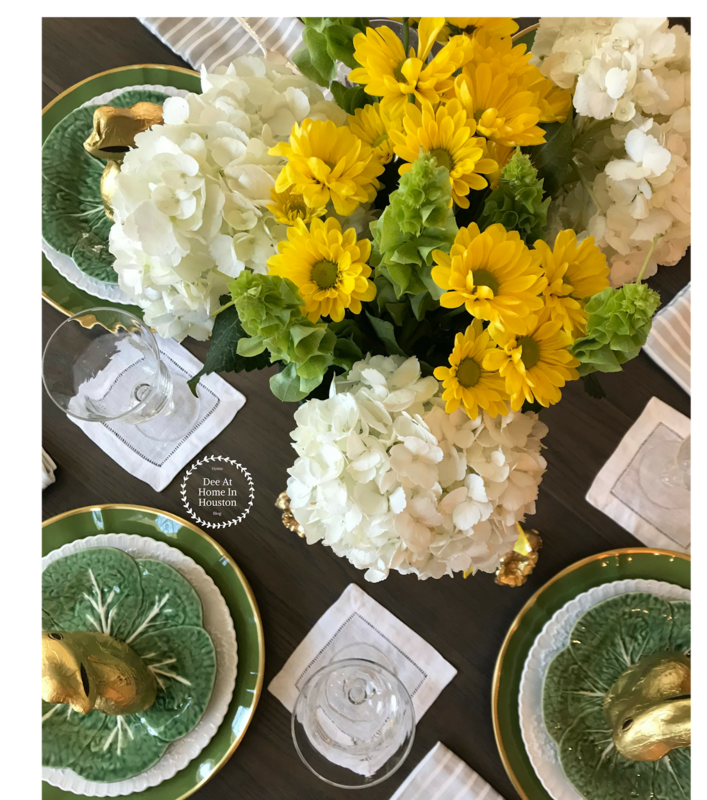 Color scheme- green, gold,white and a pop of yellow. Anyhow, lets get to the fun stuff. A little here about my thought process. I wanted to do a tablescape that was for adults. Something for a ladies brunch. I wanted to do any color scheme except pink. Not that I don't like pink, It's actually my favorite color, but this time I wanted a little more sophisticated. Something a little different. So the first place I always start is with what I already have. Viola, my green cabbage plates! 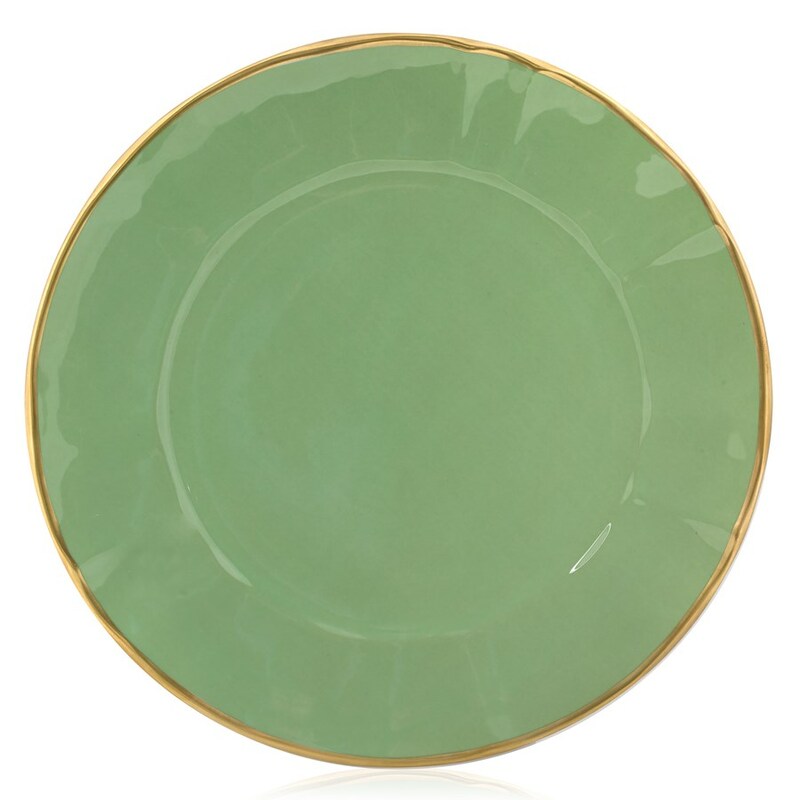 These plates are perfect for Easter. I will have a shopping list at the end of this blog but I have a secret. I have seen lots of these plates at Tuesday Morning! They can be quite expensive but if you keep your eye out you can find them discounted! 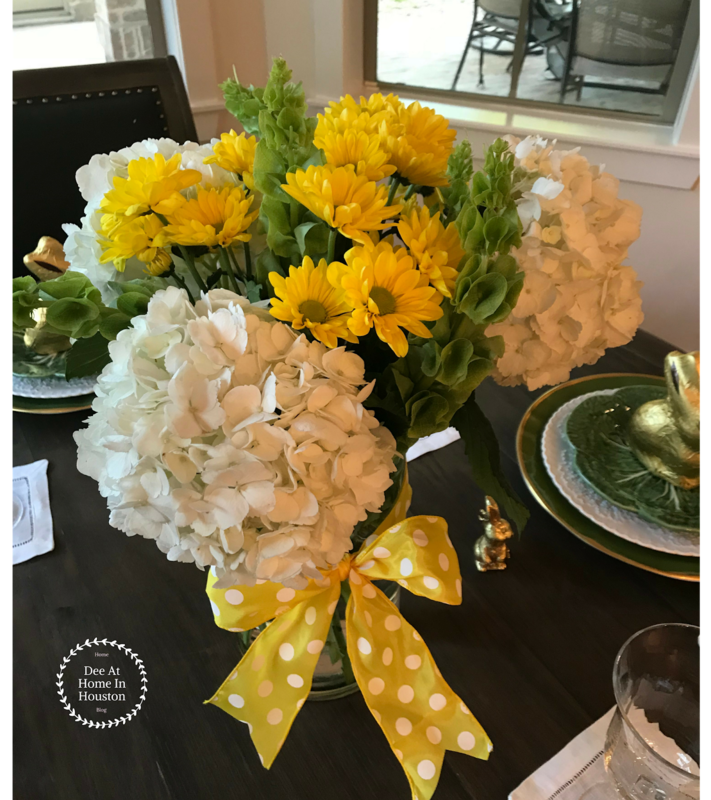 Yellow Daisy's, green Bells of Ireland and white Hydrangea are perfect, inexpensive and super easy. Need I say more? You can't see from the photo but my vase is really tall and cheap. Since it was tall you could see too much of the stems so I found a ribbon and problem solved! About the table: My first thought was to use my white tablecloth for this tablescape but as soon as I started laying out my dishes on the table, I liked the grey wood. I personally love yellow and grey so here was a perfect opportunity. (Note to self: need to do a post just on when to use a tablecloth and what type of tablecloth. )I'm so glad I didn't use a tablecloth. I think it gives it a more modern look and I liked the depth the grey added. Grey is neutral and looks great with any color. 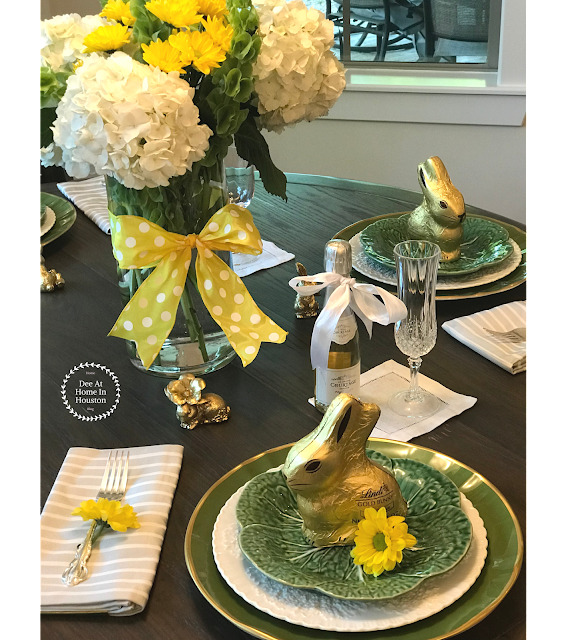 The gold Lindt rabbits were perfect for my green and gold theme. Got them on sale at HEB! And individual champagne with a white ribbon ... Yes Ma'am, sign me up! I love these Kate Spade napkins with this! I picked these up at Bed Bath and Beyond. I had originally entertained the idea of yellow gingham napkins but ultimately I was afraid that it would read too casual and I wanted sophisticated. I'm so glad I decided to go with this sleek and modern napkin. It ties in with the grey table and white plates. I was freaking out that I didn't have napkin rings but I'm so glad I didn't. I think adding the Daisy that I pinched of the flowers is great. It got me out of my box! 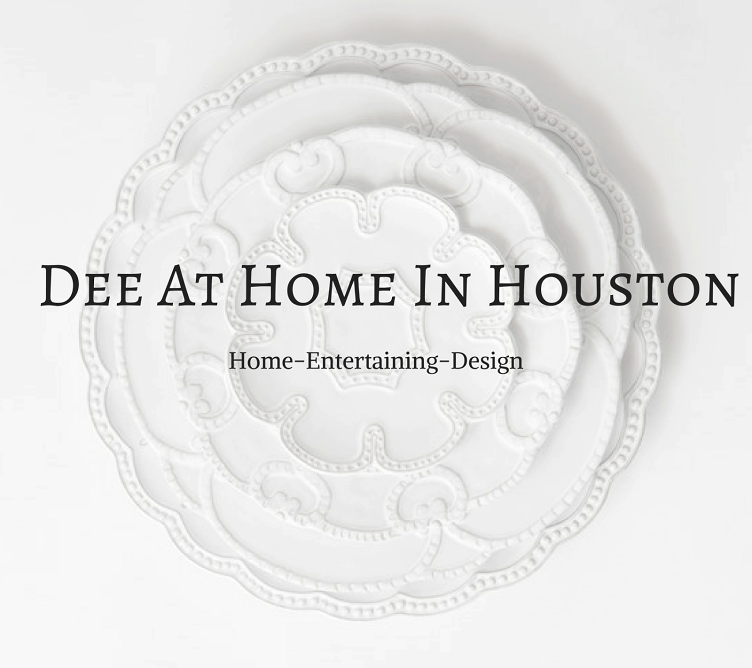 I found a set of these beautiful Spode cabbage plates at The Guild Shop in Houston.The Guild is a resale shop with a great mission: To enrich the community as a Christian ministry and resale shop dedicated to awarding financial support to organizations that serves the elderly in need. This was defiantly a win win! I found a set of 8 in perfect shape! And they were 10 dollars a piece. I couldn't believe my luck! This particular pattern was produced from 1961-1975. I've been searching and searching for the perfect white plates. I'm so glad I held out. These plates are even more beautiful in person. And, because I had to wait and hunt for them its more rewarding than if I would have bought something brand new. My advice...the hunt is half the fun. Keep your eyes open. Antique stores, Ebay and Etsy are great sources. I started collecting these plates 10 years ago. I have 8 now and I absolutely did not pay full price for these. About the artist : Bordallo Pineheiro was established in Porturgal in 1884 by Raphael Bordallo Pineheiro. I think I found my first few plates at Homegoods! And since then I found a few on Etsy and now I've seen in healthy quantities at Tuesday Morning! 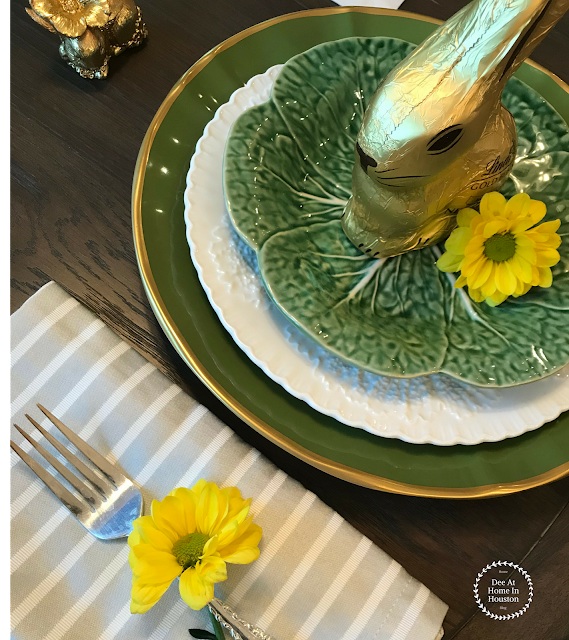 The possibilities for spring and summer place settings are endless. I defiantly, think you will get your moneys worth with these workhorses! Anne Weatherly is on of my very favorite modern artists. In the early 1990's she established a studio in Budapest, Hungary where she trained a group of highly talented painters to create her collection of hand-painted porcelain.You won't find any bargain basement prices here. These are an investment but I think they are so worth it! I have no problem asking for a plate of charger, etc. for birthdays, Valentine's day, etc. I hope you found some ideas that you can incorporate into your Easter!